Canada also recognizes persons in need of protection because removal to their home country would subject them personally to a danger of torture, a risk to life or risk of cruel and unusual treatment or punishment. You can make a refugee claim either at the Port of Entry (POE or Inland at a CIC office. If you make the claim at a POE, you will be given a Basis of Claim (BOC) form that you have 15 days to fill out and submit. If you make an inland claim, you will have to complete the BOC and submit at your eligibility interview. The timeline for your refugee claim process depends on where you make your claim and whether your home country is a Designated Country of Origin. Your refugee hearing will be held anywhere between 30-60 days after you submit all the documents relevant to your claim. It is important to gather evidence that can verify your story such as medical reports, police reports, articles about the situation in your country etc. A lawyer, paralegal or immigration consultant can represent you in a refugee hearing. Refugee hearings are not open to members of the public. A member of the Refugee Protection Division of the IRB will preside over the hearing. In some circumstances, Minister’s counsel may participate. There will be an interpreter present if you have requested one. The board member will ask you questions about why you left your country, why your own country can’t protect you and what you fear will happen if you return. If you have a lawyer or consultant, he or she can also ask you questions and make submissions on why you should be granted refugee status. 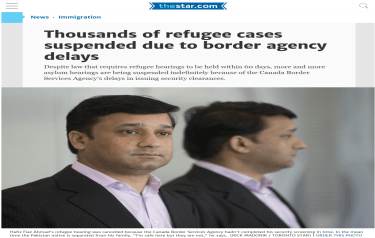 If your claim for refugee status is accepted, you can apply for permanent residence in Canada. Note that CIC can appeal positive decisions. If your claim for refugee protection is denied, you may have access to the Refugee Appeal Division, depending on certain conditions.